Transformation of Forest Resource Use in Laos from the Second Half of the Nineteenth Century to the Present: How Have People Concerned Themselves with the Forest? I have just begun my study as a Research Fellow of the 21 st Century COE Program, using the Laos Field Station (LFS) as my base of operations. I would like to report on some of the activities of the LFS from March through April 2004 and on the individual research plan which I am about to carry out as part of the 21 st Century COE Program. The LFS sees the promotion of collaborative research with local researchers as one of its main activities. Mr. Saysana Sithirayvongsa, a young researcher who graduated from the Faculty of Forestry, National University of Laos, and Mr. Yasuyuki Kosaka, a graduate student of ASAFAS, conducted collaborative research and presented the results at the workshop. This demonstrates that cooperative relations are being built with our counterparts. 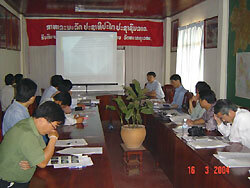 I began my research in Laos as a Research Fellow of the 21 st Century COE Program on April 5, 2004 . The theme of my research is "Transformation of Forest Resource Use in Laos from the Second Half of the Nineteenth Century to the Present: How Have People Concerned Themselves with the Forest ?" It is generally believed that Laos is one of the world's most prominent "forest countries," endowed with abundant forest resources. Even though Laos ' forests were nearly destroyed in the second half of the last century, most villagers still live with a close relationship to the forest. 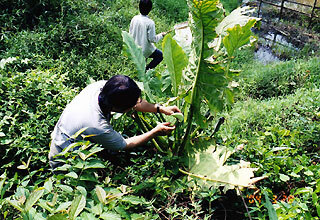 In reality, Lao people have used various kinds of forest resources in their daily lives from ancient times. It is no exaggeration to say that forest resources have been one of the most important sectors of the Lao economy. In other words, the"history of forestry," or the"history of the forest" in a wider sense, including the transformation of forest resource use, should occupy a principal position in the overall study of the history of Laos . In recent years, with the rise of interest in forest conservation and rural development, many scholars have studied various issues concerning the present state of forests in this region, e.g. slash-and-burn farming, land-forest allocation policy, non-timber forest products, and economic activities in the mountainous districts. However, changes in forest resource use from the past have not been seriously considered. Needless to say, the relationship between villagers and forests in the present age originated from the accumulation of knowledge and experiences handed down from their ancestors. In order to understand current problems involving the Lao forest, and to find solutions to them, we must re-examine the use of forest resources in a historical context. 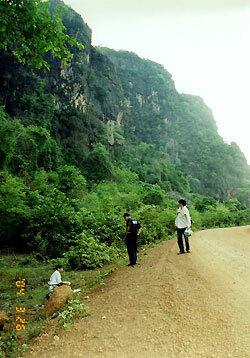 This study aims to examine Lao forests from two aspects. (1) How did the forest management policies of the French colonial government, and later the Lao government, affect the lives of forest villagers from the second half of the nineteenth century onward? (2) Under this situation, how have people concerned themselves with forests (forest resource use)? Thus, it can be said that the goal of this study is to compile the historical background for the collaborative research"Local Natural Resource Use and its Transformation in Laos" for the Laos research group. At present, I am in Vientiane collecting and classifying documents and gathering the information necessary for selecting the field survey site.